Arup Future of Rail 2050 - .PDF file. From greater reliability to faster inter-city connections, most of us can probably think of ways in which the UK’s rail network could be improved. As a regular commuter, I’d settle for a season ticket that costs less than a small island, doors that open when they’re supposed to, and ticket inspectors that don’t behave like members of a shabby paramilitary group. 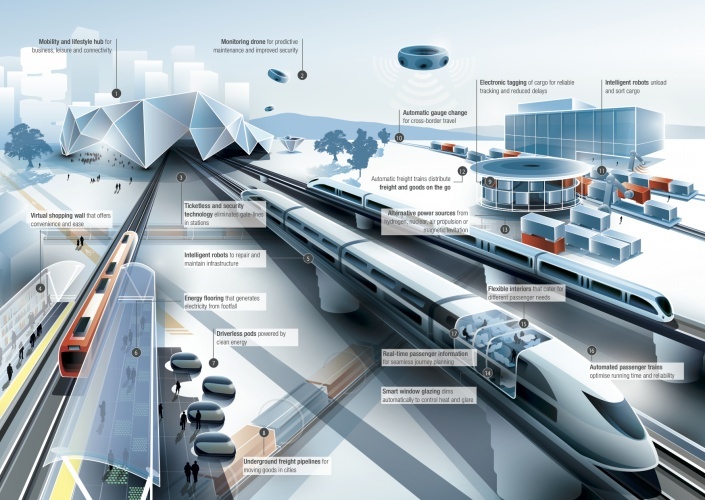 But in its “Future of rail 2050” report – which was published earlier this week – engineering consultancy Arup goes several steps further and sketches out a vision of the future where autonomous trains, unmanned flying maintainance drones, ticketless travel and a host of other advanced technologies usher in a new golden age of rail. On the surface, the report – which you can read in full here – might sound a little far-fetched. But whilst it may be mildly reminiscent of those1950s visions of the future that predicted we’d all now be living on the moon and driving around in flying cars, it’s underpinned by real projects and real technologies. For instance, driverless trains are already used in a number of cities, high speed rail networks are springing up all over the world and, intriguingly, Dutch railway company ProRail is already using drones to check the switch point heating systems on its tracks. And there are many more examples of disruptive rail technologies that are already beginning to make their mark. More importantly though, the report has been prompted by a realisation that our transport infrastructure must evolve rapidly if it’s going to be able to cope with a host of increasingly pressing demographic and environmental pressures. From the impact of climate change to the rapid growth of urbanisation – and the challenges posed by an ageing global population – the world is changing fast. And the kind of piecemeal evolution that has characterised the development of our rail network isn’t going to get us there. Ultimately, Arup’s vision of the future of the future is a compelling one, and although its debatable whether rail transport will look anything like this in 2050, it does at least start an important debate about how a traditionally conservative, slow moving industry should be planning for a future that’s bearing down on us fast. Magnetically levitated Trains are moving rapidly ahead. Permanent magnet suspension is safer-no power required except for curves & wind. Nearly Silent. New linear DC motor, Armature & field on board. Passive steel track;low cost & faster. I think they should move towards MagLev. My own proposals, at http://www.LeviCar.com/, are for a high-speed MagLev for large countries such as the USA and Canada. I WANT TO USE TRAINS!!!!!!!!!! But I can’t because they are sooooooooo bad in this country. Nasty, expensive, cattle transportation thats leaves you needing a car at the other end anyway. Either the fundamental concept is so outdated it should have been killed of 30 years ago or someone needs to seriously rethink each end of the journey, not the in betweeny train bit. I want to get from the smelly cattle truck to my house without a bowler hat, brolly and shank’s pony. Nor do I want to be picked up by my adoring wife in her headscarf and Cortina or my butler in the Rolls. It’s not the effing train that’s the problem! MagLev is a beautiful thing, but in the real world what do we do about the train drivers who are the only obstacles between us and driverless trains and the advantages that would bring to the rest of us. It does seem to be a very “foresight” type report. And only addresses high speed traffic/ London centric; possibly the implication that more of the poulation will live in London. Rather than the challenges and opportunities of repealing the changes of Beeching and Castle, which are so much needed. MagLev is an interesting option but there is also the building of the infrastructure for a network – which I would be something that Arup should have some information on. The report reads about big projects and politicians wanting a new even faster train to play with. I understand the logic of trying to de-risk projects like HS2 by using off the shelf technology but think it’s a real pitty the govenment aren’t being more adventurous and considering MagLev (or similar). Realistically, the project is going to over-run and cost more than expected – just because projects like this usually do. Why not bite the bullet and get on with something that the world would envy! What its rail’s problem? why it is always cheaper to travel by bus or coach in the UK? I just can’t have any sympathy or interest in all this technological wishful thinking about something that so utterly fails to actually deliver transport because it’s so brutally pricey. On the whole, why not just go by coach and build more roads? Perhaps rail should be for rich people? It needs competition of the sort that Uber is giving those ridiculously expensive black cabs. Rail is the future but capacity in all its forms is so contrained that demand horribly outstrip supply meaning market prices are just too high to bring about a step change in our travelling habits. What’s needed is a multiplicity of routes between destinations and an intelligent routing system akin to the internet. In short our North-South orientation which is funnelled through strategic locations creates pinch points and bottle necks. Not only does this reduce flow but also makes the network less resilient. In practice the future is more point-to-point travel, driverless carriages, intelligent routing and scheduling and intelligent, on-line grouping of carriages on main lines to form trains on an On Demand basis. An interesting twist on the internet of things. And, it is sad, but I expect the policy of de-risking projects is an important issue; much better to manage the risks. Is this a fault of politicans or of strategic rail thinking? ; “foresight” not innovation! Rail transport is inherently inflexible because it runs on rails. Modern technology is giving us far more flexible and adaptable forms of transport with self guided vehicles that can vary their route to pick up passengers from where they are and deliver them to where they want to go. Rail is effective and economic for moving heavy loads long distances. For everything else, modern road transport technologies are better and cheaper. There are two good reasons that intercity motorcoaches are less expensive than trains. The other is that they are the most fuel-efficient of currently-available, enclosed, motorized passenger transportation. This is shown on a graph at http://www.aertc.org/conference/AEC_Sessions%5CCopy%20of%20Session%201%5CTrack%20E-%20Innovation%5CIntelligent%20Advanced%20Transport%5C3.%20Dr.%20James%20Powell%5CJames%20Powell%20presentation.pdf — look at page 10. Only MagLev can beat them in fuel economy. 3) Much lower electricity consumption. It will also be a lot cleaner because it uses less electricity; and even if the electricity is derived from polluting sources, there will be less pollution than conventional transport. As a Helicopter pilot flying to destinations around the uk, I’m surprised to see that looking down our train lines have so few trains actually travelling along. Most of the time there are distances in excess of two miles between one train and another. By comparison most of our road transport is travelling along our roads bumper to bumper! Also, to reduce rail traffic congestion at busy times of the day we could easily build more railway carriage sidings and store trains ready for call off.